Why this hotel? Close to the gay beach. Free WiFi. 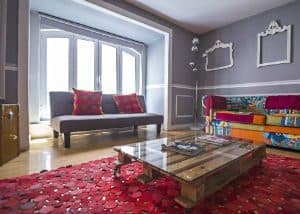 owner’s description: Villa 3 Caparica is a beautiful gay hotel, perfectly located between Lisbon and the very famous Lisbon gay Beach, “Praia 19” or “beach 19”. 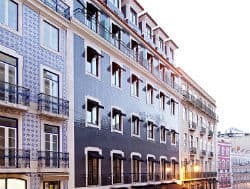 The hotel is about 15 minutes from the Gay Center of Lisbon “Principe Real”. Your room comes with private bathroom, high beds with top class Portuguese Matrasses (Koala Rest). The short distance to the city and the beach make this quite 2700 m” resort the best place for your vacation in Lisbon. Close enough to visit, but in a oasis of green and with a lush tropical garden. Perfect for a city breaks, combined with a relaxing day in the Spa, or relaxing in the private garden for the hotel guests, or mingling with the day guest at the pool and in the Spa. A generous breakfast is included in your room rate, quality Wifi is free, a full bar with snacks and a very friendly staff that will assist you and make your stay a wonderful experience. A vast selection of things to do beside visiting the fantastic city of Lisbon are besides the gay beach, The beautiful city of Sesimbra, the Serra de Arrábida, Setubal, Palmela with its Castle, cheese factories and vineyard where Villa 3 house wine is made. The officially 3 star rated, all male gay hotel (hetero-friendly), offers services that you will only find in 5-star hotels, such as full spa with sauna, jacuzzi, steam bath and large heated swimming pool. Villa 3 is more than a Gay resort Hotel, it is a way of life. “I am a solo traveller, and was looking for a place that I could meet other travellers or people, make friends and relax. I cannot talk highly enough for the service I received at Villa 3 Caparica. Eddie, Marcos, Carlos and Jose were all accommodating and helpful to me a solo traveller, with no portugese. A continental breakfast was available each morning, a freshly squeezed orange juice is highly recommended. As are Gloria’s (the cook) Custard tarts, freshly baked each morning, to the point that the custard was still warm. Eddie and Marcos have a bar in the old town, and offer you a lift in if you would like to go to the Bar, but it is only 12 euro by Uber. The rooms are extremely spacious, and the bedding and bathroom linen are luxurious. I had a pool room with the pool and the jacuzzi just outside, available for guest use any time. The other facilities were open from 1pm and on the weekends, the hotel hosts a party where many locals attend to make you feel very welcome. I stayed for 5 days and drank many cocktails, expertly made and great value. Peter on 01-Apr-2019 | Reply	Problem with this review? Amazing new gay holiday paradise ! “I stayed in Villa 3 Caparica with a friend of mine and we had a fantastic relaxing time. The owners are the sweetest bears on earth. Everything is brand new and made with so much attention to detail. The place is ideal to relax and to party :). Roman on 09-Dec-2018 | Reply	Problem with this review?